Traditional varnishes have two basic components: a hard film and a soft film. The hard film is basically reconstructed tree sap.. rosin (the solids from sap) mixed with turpentine (the volatiles from sap). The soft film comes from a 'drying oil' like linseed oil which starts as a liquid but oxidizes to a rubbery gel when exposed to air. The hard film can be polished to a brilliant shine, but it's brittle and sits on top of the wood. The soft film doesn't polish as well, but is resilient and penetrates into the wood. Combined well, they give you the best of both worlds. Combined badly, they give you the worst. Modern acrylic and polyurethane finishes produce a plastic film that does everything. It's harder than a drying oil film, but more flexible than a rosin film. It penetrates into the wood while it's wet, but leaves a layer of solids on top of the wood when it's dry. The plastics aren't perfect replacements for the old varnishes though. Their surface isn't as hard unless you use the nitrocellulose lacquers, which are difficult and unpleasant to work with. There are also significant differences in color. Traditional varnishes are yellow.. the cheapest rosins and oils are dark orange, and even the best ones have a light honey tint. The cheaper plastic finishes have a purplish cast, and the good ones are truly transparent. Unfortunately for the modern finishes, a piece of wood coated with cheap orange varnish looks rich and lustrous, where a piece of wood coated with truly clear plastic looks like wood-colored plastic. That doesn't mean you can't get a good finish from modern varnishes. You just have to work to their strengths, just like any other material. A good plastic finish looks different from a good traditional finish, and a cheap plastic finish looks very different from a cheap traditional finish. I'm heading for a steampunk look with this project, which means I want a cheap traditional finish. A lot of woodworkers dislike shellac, largely because of its association with a finishing method called 'french polishing'.. arguably one of the most fussy and labor-intensive techniques in existence. The idea is that you lay on a bazillion very thin coats of shellac to produce an absolutely beautiful but extremely fragile finish that dates back to the "so perfect it's practically useless" era of conspicuous consumption. That's a pity, because shellac is a workhorse of an industrial chemical. It's soluble in alcohol and leaves excellent films from even highly thinned mixes. It melts at moderate heat any number of times, but sets hard when baked at about 300 degrees. It's sticky as glue when it's partially dissolved or molten, but stiff as glass when it's cold and dry. It's highly resistant to acids, but can be washed off with warm alkaline solutions. 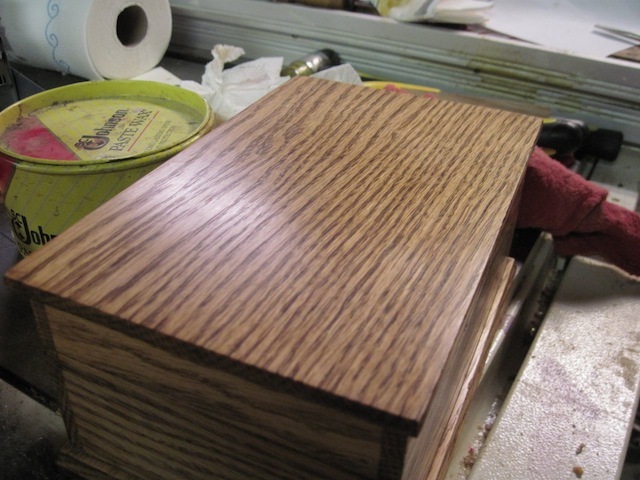 The first layer of shellac isn't technically a finish. It's wood filler. All wood is porous, and oak is famous for its pronounced grain. 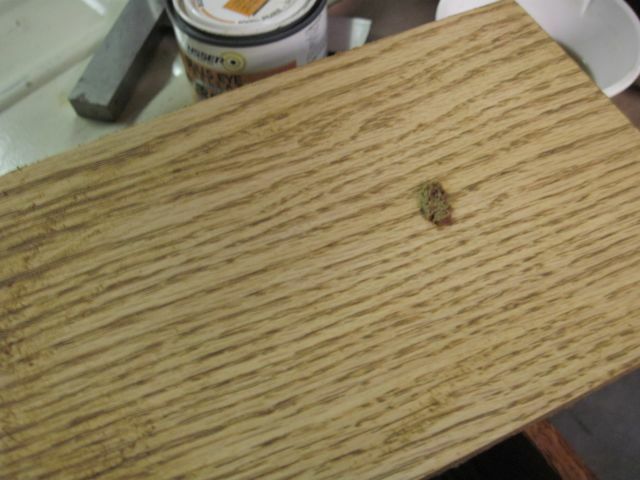 If you apply finish to unfilled oak, you get a film of solids on top of a fundamentally rough surface. To get a smooth surface, you need to pack all those tiny holes full of something. The alcohol melts and thins the shellac, which mixes with the sanding dust to form a slurry. That slurry gets forced into the pores of the wood as a natural consequence of the sanding. I've talked elsewhere about taking a series of progressively less sloppy approximations to the final product you want. That idea carries over to finishes as well. and the top thousandth of an inch or so, which does the actual shining. As long as the film is a fairly uniform thickness, and the top thousandth of an inch is reasonably smooth and flat, you have a good finish. The quality of the film gets more important the closer you get to the surface, but by the same token, the quality gets less important the farther away from the surface you go. The process of building a surface involves putting progressively less sloppy layers on top of the film. 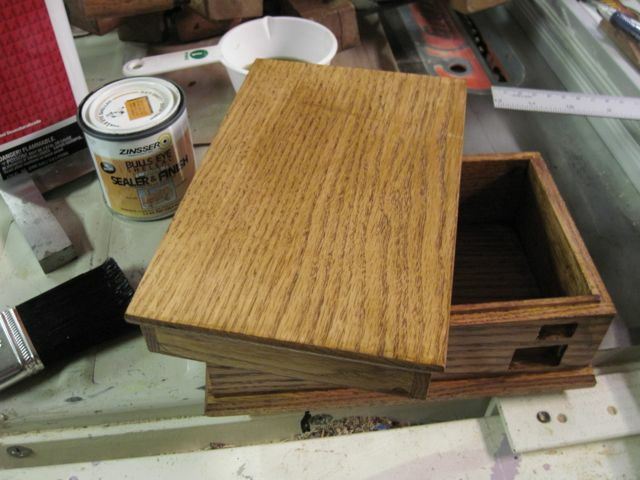 In this case, I built the surface with layers of shellac and danish oil, which is itself about 90% oil and 10% solids. 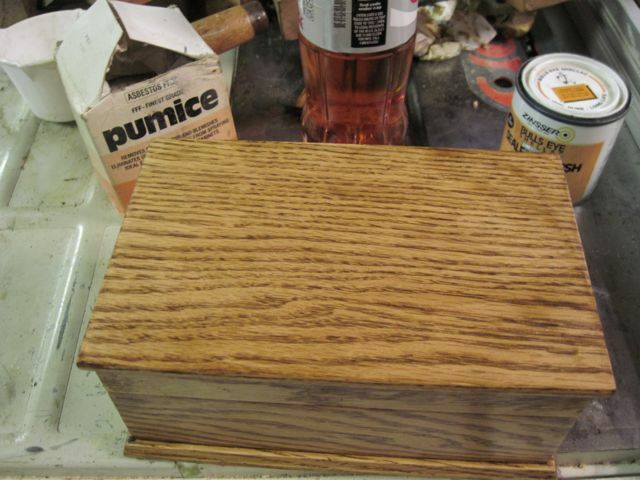 I'd put on a layer of oil, let it soak in for a while, then wipe the piece down and smear on a layer of shellac. When that dried (another nice thing about shellac is that it dries in about five minutes), I'd smooth the surface down with pumice, a flat piece of wood, and more oil. Most people would probably call the flattening process 'sanding', but since it involves a loose abrasive between two working surfaces, it technically counts as 'lapping'. An abrasive particle in a piece of sandpaper cuts by plowing a groove through the surface it's cutting. The force that does the cutting points the same direction as the particle's motion: parallel to the surface. The material cut away from the surface forms a chip that gets pushed ahead of the particle. An abrasive particle in a lapping slurry rolls across the surface it's cutting, so it cuts as its jagged edges push into the surface. The force that does the cutting points down into the surface. The material cut away from the surface goes to either side of the particle, and forms a trail behind the particle as it rolls along. The upshot is that a particle in a lapping slurry cuts less aggressively, but more steadily. You can get a good cut with very little abrasive (for this project, I used lumps of powder about 1/8" across), and can control the cut both with speed and with downward pressure. It takes some practice to learn how a good cut feels, but once you do get the feel it's surprising how fast you can grind stuff away. It took about three passes to get the whole surface smooth, then I added a couple more layers to get the thickness of film that I wanted. 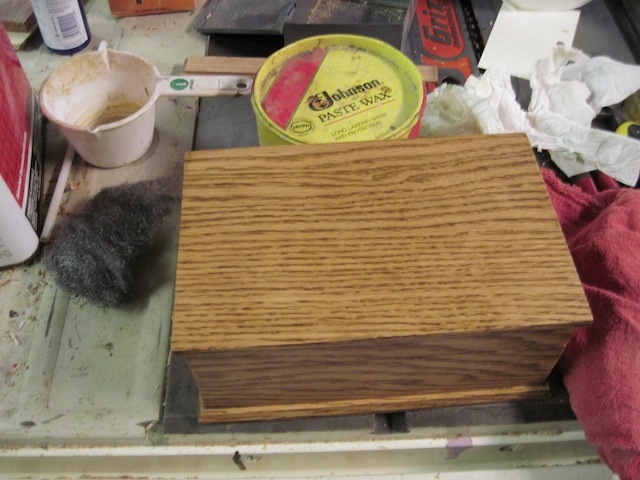 I ended by wiping the surface dry, letting the box sit overnight so the varnish had a chance to harden a bit, then applied one more layer of half strength shellac to make the final surface. The technical term for shellac concentration is a 'cut', and is measured in pounds of shellac per gallon of alcohol. The standard concentration you'll buy at the hardware store is a 'one pound cut', meaning a pound of shellac per gallon of alcohol. If you mix a gallon of that with another gallon of alcohol, you get a 'half pound cut'. The layer I added was half pound cut, and I wanted to give the existing finish time to harden so the additional alcohol wouldn't melt what I'd already done. I let that dry overnight, then moved to the last stage of the finishing process. For this part, I used fine steel wool and a hard wax. Steel wool is essentially a bundle of very small, very flexible knives. As you move it across a surface, those knives slice away the high points. The finer the steel wool, the smaller the knives, and the smaller the slices they shave away. Carnauba wax produces another kind of hard film. It isn't as durable as the solids in varnish, but goes on easily, fills small gaps and scratches, and takes a brilliant shine. The stuff that comes in a can is mixed with a solvent so you can wipe it on as a paste, then it hardens to a film as the solvent evaporates. If you use the wax paste as a lubricant while smoothing the surface of the film with steel wool, a couple of good things happen: First, the wax flows into any small scratches the steel wool leaves behind. Second, the wax absorbs the shavings the steel wool slices off the film. Then the wax carries the shavings into any scratches large enough to hold them. 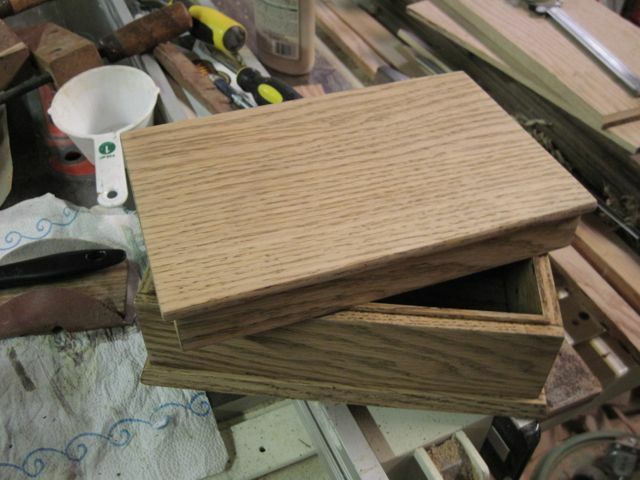 The overall process is a lot like filling the grain of the wood, just at a smaller scale. The picture above was taken just after the buffing. All the work is done, but the whole finish is still relatively soft. After a few more days of curing, it had acquired the hard, slightly brittle-looking surface I wanted.